The Chapel was born in the ashes of the Blitz and seeks healing for a broken world. This page will explore the task of reconciliation. 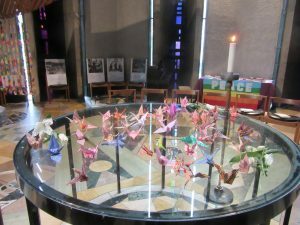 Our annual service to mark Hiroshima Day produced a display of cranes across the Communion Table.